Red Root is indigenous to America and has been used primarily for afflictions of the respiratory tract. The deep red body of the root as a medicinal plant is powerful, and some believe it is underutilized. Another reason this herb holds such importance in alternative treatments is the benefits it has for the spleen and lymphatic system. Deficiencies of the spleen may result in edema, anemia, irritable bowel and swollen lymph nodes. Because Red Root extracts are a great expectorant and have been found to use for bronchitis, sore throats, chills and fatigue. The red root contains important active constituents, including a high concentration of tannins and alkaloids. It has also been used as a mouthwash or gargle for mouth ulcers and tonsillitis. The properties have also been used in conditions such as dysentery, diarrhea, gonorrhea, and gleet. Where there is a pattern of symptoms present in the body, Redroot may be effective in reducing inflammation and clearing boggy tissues in any number of conditions. This includes old bronchitis to sinusitis, hepatitis with congestion, and all sorts of nagging pelvic pain with a sensation of heaviness, swelling or bloating. The extract of Red Root exhibits strong expectorant properties, which help to loosen up the phlegm that gets stuck in our lungs. This makes the herb beneficial for those who are suffering from the common cold and other respiratory infections. It also is believed to be antispasmodic, which is helpful for relaxing muscle spasms in the body and helps to control coughs, relieve headaches and reduce fever. It has also been known to have a sedative effect, which can be beneficial for getting proper rest when you are ill.
Red root is believed to help lower blood pressure. The active chemical compounds in the herbal tincture include resin, alkaloids, tannins and coagulant effects. The plant is primarily used to kick up the charge, helping blood cells and inner vessel lining to repel each other better, the blood changes and may flow better. It is also believed to clear the channels of dampness, and to decrease inflammation, increasing function, and allowing the body to transform food into energy, increases circulation through the arteries and may even help limit chest pain. The coagulant effects may be helpful for internal bleeding, such as uterine hemorrhage or nosebleeds. Extracts from the root are thought to be effective for shrinking breast and ovarian cysts. In addition to these health benefits, Red root tincture is a great herb for detoxifying and balancing the body. It is beneficial for a healthy gut, including the spleen, kidneys and especially the liver. The spleen plays a major role in digestion and when disorders are present, in disease or syndromes, it is usually contributed to a deficiency of the spleen. This appears in Irritable Bowel Syndrome (IBS), Crohn's disease and colitis. The astringent qualities have been used by herbalists for diarrhea, for shrinking hemorrhoids, for killing viruses. It also works for improving lymphatic circulation and may be beneficial in the treatment of edema and other problems related to the spleen and liver. It is thought to be an effective treatment, by many herbalists, for enlargement of the spleen and prostate gland. Medicinal extracts of Red Root are also used topically for controlling acne and healing skin lesions. The plant has also been used in a form of mouthwash for healing infections of the mouth, for sore throat relief and to prevent plaque build-up. Ingredients: Red Root, Structured Water, 20% Alcohol. Non-Alcohol: Red Root, Structured Water, Vegetable Glycerin. Contraindications: As with any form of herbal remedy, women who are pregnant, or wish to become pregnant, are advised not consume Red root tinctures, or teas, as it may lead to birth defects. This also applies to women who are breastfeeding. Red Root extract is considered to be safe in small doses, and is also considered to be safe for continuous and extended use. 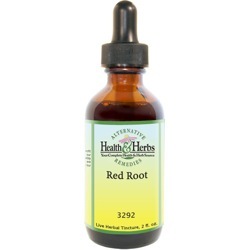 Because of the coagulant properties Red root tincture should not be used with blood thinning medications. Those who rely on iron supplements should also avoid this herbal liquid extract, as it may block the absorption of iron. Too much of the extract of Red Root could cause symptoms such as, irregular heartbeat, insomnia dizziness, loss of appetite, diarrhea, and headache. With few side effects, and quite a few benefits, it can be included in most daily diets. From Kathleen Milburn of Palm Coast, Florida on 2/1/2015 . From Anonymous of Pearland, Texas on 8/9/2014 .